Think Inbound Marketing and Ad Tech Don’t Mix? Think Again. NP GroupBlogMarketingThink Inbound Marketing and Ad Tech Don’t Mix? Think Again. You've probably heard or already assume that ad tech and inbound marketing do not play well together. Ad tech was the king of marketing for many years until upstart inbound marketing took a foothold. Now the two styles of marketing do, in fact, compete for the same respect and dollars from the corporate marketing operations chief. Recent news indicates, however, that this landscape is changing again and that there is a place for inbound marketing in the ad tech industry. 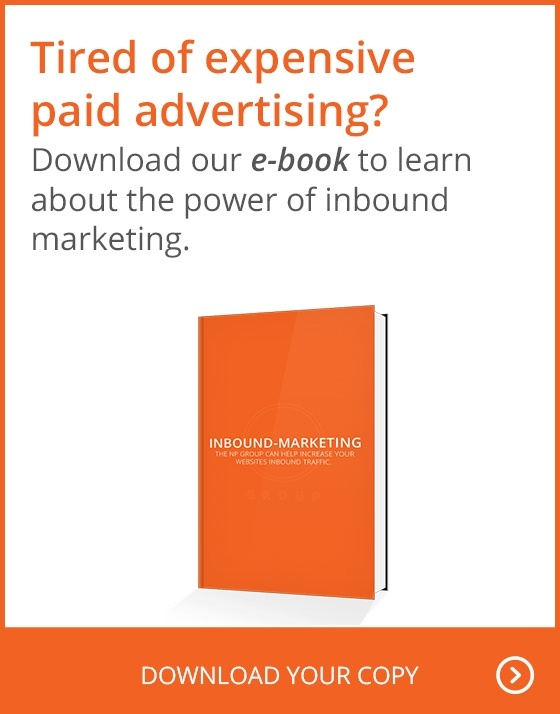 Inbound marketing has been extremely successful for both small and large companies. While it’s true that most, if not all large companies still rely heavily on outbound marketing, for online marketing, inbound is the winner for companies of any size. Let’s first examine why traditional marketing can fall short, and then how inbound marketing can pick up the slack. Since 2012, surveys have shown that we increasingly access the Internet through our smart mobile devices, whether it's for email or direct browsing. The problem for traditional marketing is that outbound paid marketing conducted online relies on cookies and cookie tracking. Why is this a problem for paid ads? It worked well when consumers used their desktop computers to access the Internet, but mobile devices do not support cookies. Without cookies, the way paid companies advertisements target customers ceases to function. Furthermore, there’s the whole issue with ad blockers that reared its head earlier this year with the release of iOS 9 for Apple products. Game-changers like this will only continue to occur, leaving the need to rely on exceptional content marketing bigger than ever before. Site visitors like to experience a more personal touch from the brands with whom they choose to interact. A perfect example of this is when a visitor searches for a particular topic on the Internet and finds a company with content on its website related to the specific information he or she is seeking. They decide to visit the website and then stay there. Why? Because if the content is compelling and answers his or her questions, a trusted bond results. Let’s take it a step further. Suppose the brand’s website offers a helpful guide or white paper relevant to the visitor’s questions, and all they have to do to obtain it is fill out a form. This interaction gives the marketer more information about the visitor and what they need or want. When you factor in, say, a well thought-out workflow that continues to deliver relevant information to the visitor, the path to converting them into a lead and then a customer becomes clearer. This is a level of personalized interaction that ad tech can’t always achieve, as it’s occurring on the consumer’s terms, not the other way around. A typical part of marketing these days is a concept called "retargeting." All that term means is that if a customer visits your website and doesn't complete a sale or fill out a contact form, the marketer can target them again through the web to entice them to come back and visit again. Companies like Google and LinkedIn Marketing help many businesses do this, and Facebook has some excellent tools to make this super effective. This term simply means that marketers can focus on former customers to try to get them to come back and buy again. In this instance, the marketers use paid channels to entice the former customers to return to the fold, perhaps by boosting relevant content or special offers. This concept means that companies who use inbound marketing accumulate data on who their best customers are, where they are, their interests, etc. Their databases permit the slicing and dicing of this information into various demographic pies. If paid advertisers can tap into this information, their clients will save money on paid advertising costs because the advertising becomes "targeted" toward audiences who "look like" the client's current customer base and, presumably, more likely to buy products from the client. This all is just the tip of the iceberg when it comes to how inbound marketing and ad tech can merge. Ostensibly, that merger may become inevitable as the landscape of digital marketing continues to evolve. But the ratio of inbound to outbound marketing that will work varies from company to company, so educating yourself on both is the first and most important step to finding the right balance.